Are you considering bringing a dog into your home, but just can't decide which one best suits you? Or Are you Curious about the different breeds of dogs and know about it. We are here to help choose the right dog for your lifestyle. Read descriptions and view photos of over 150 dog breeds. 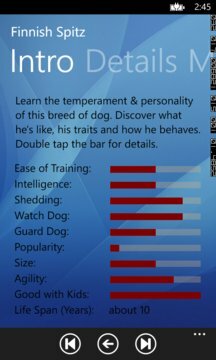 Find out about the temperament, behavior, and characteristics of each breed and discover what the breed is like to live with. 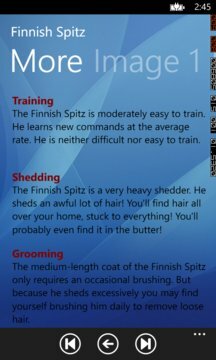 View lists of breeds with common characteristics. And use our dog breed selector to sort through all 150+ dog breeds to find the one that’s perfect for you. You can select a dog according to your required characteristic like Intelligence, Ease of training, shedding or popularity or you can search a breed by its breed name. No Internet connection required. Will be regularly updated to accumulate any further data and information. Next / Previous button added to go directly to next and previous breeds.